It’s almost that time of the year again when we think about getting something romantic for the special person in our lives for Valentine’s Day. Most personalised presents take at least a few days to actually be made so these ideas might not be much help to those of you whose Valentine’s Day contribution involves picking something up from the petrol station on the way to see your loved one. But for those of you looking for a personalised gift for someone special, here are some suggestions and tips as to what’s available. Chocolate is the obvious choice and it’s hard to go wrong, really, because who doesn’t like a nice chocolately surprise? 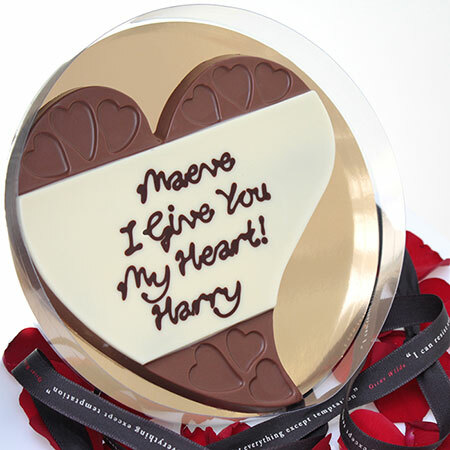 This beautiful Belgian chocolate love heart can be customised with a message up to 36 characters in length. The handwriting is lovely and swirly and the chocolate is delicious. All you have to do is think of a message to gon it. The Belgian chocolate love heart costs £14.99. Champagne is about as synonymous with Valentine’s as you could hope to get, so if you want to play safe and stick a reliably romantic reward, how about a bottle of personalised champagne. Champagne and chocolates are all very nice of course but are unlikely to last long beyond the night it self. For something more durable, how about some personalised underwear? Our friends at Spreadshirt offer a range of personalised clothing including boxer briefs for him and a string thing or hip hugging undies for her. Find out more about personalised underwear. Hopefully these ideas will give you some inspiration and what better message to add to a personalised gift for Valentines’s day than a marriage proposal. Check out our ideas for 5 great places to pop the question!